NOTE: This is the first of a 4-part series inspired by Nelson Searcy's The Journey church. 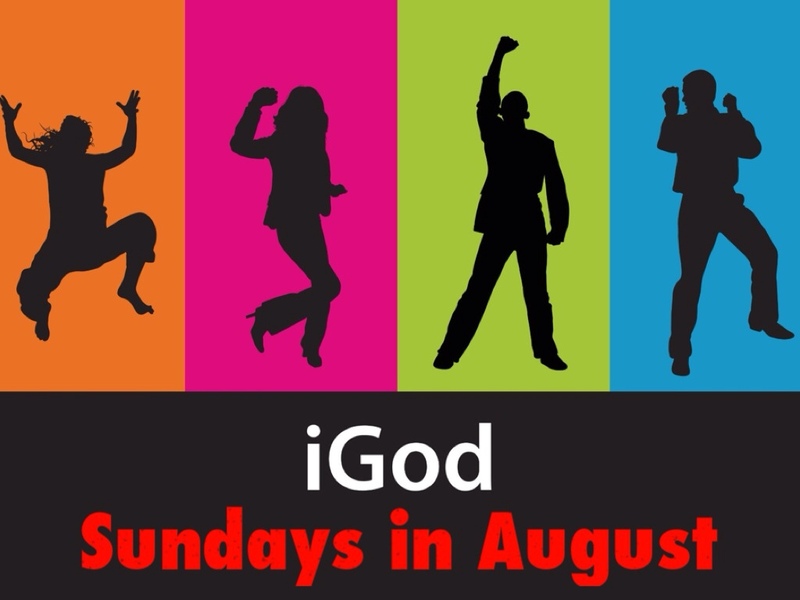 Today, we begin a 4-part sermon series called iGod. During the course of this month, we will discover what it is God says God is and what that means for us. The famous answer to this question can be seen in Exodus, right. God is speaking to Moses about the plan to rescue the Israelites from their captivity in Egypt, and Moses is curious as to how God would like him explain all this–essentially, “Who should I say put me up to this?” God says, “I AM who I am.” It’s cryptic, but it says it all–even if it doesn’t say much. It’s difficult for us to say who or what God is. How do we put everything into words? That is to say, “How do we begin to understand that which created our understanding?” We do have help. We have nearly two-thousand years worth of theologian’s work to best answer this question. We have our encounters with God through the Holy Spirit. Additionally, we can look to scripture for guidance. Unfortunately, it’s not always easy to understand. This differs greatly from the way Apple does things. For those of you who may not know what I’m talking about, let me introduce you to Apple. Apple is the standard-bearer when it comes to revolutionizing the way humans interact with a digital world. They got their start in computers back in the 1980’s. The first computer I ever used in a classroom was an Apple II. They were the first computer company to embrace the mouse. Can anyone imagine using a computer without a mouse? Apple is responsible for that. They remained pretty quiet through most of the 90’s, then released the first iMac. Do you remember these? They came in bright colors (blue, orange, red) and resembled space ships. Everything you needed was either contained within the iMac (disk drives, speakers, etc. ), or connected by simply plugging it in (mouse, keyboard). It really began Apple’s current run as the #1 computer technology innovator. I am going to say that there are at least 5 devices in this very room that were manufactured by Apple, and they all begin with the same letter. “i.” If you don’t have an iPhone, I am sure you know someone who does. If you don’t have an iPod, I am sure you have bought one for your grandkids for Christmas. If you don’t have an iPad, I recommend you get one. They are so handy. You might not know this, but there is a bit of a rivalry between Apple and–well–the rest of the technology sector. Apple is very protective over it’s company, it’s profits and it’s intellectual properties. How so, you say? Right now, Apple is taking another cell phone manufacturer to court in order to make them stop selling their phone. Apple’s rationale? They claim that no one would know what a smartphone was if it weren’t for Apple. Apple is the source of everything and no one should be able to claim what is rightfully Apple’s. That’s a bit hyperbolic, but you get the idea. The brilliance/madness doesn’t stop with the way they protect their brand. You know this if you have ever been to an Apple store–or were too scared to go in and just walked by an Apple store. As stores go, it is intimidating. The first thing you notice is that everything is set against a white back ground. If you have ever seen a television show film a scene in heaven, you know what I mean. Chairs, tables and paintings are all in place, but the walls and floors are nothing but clouds. Everything is so clean and bright–and that just makes you want to touch and feel all the toys that are placed ever-so lovingly throughout the store. Do you need any help? The smily people in the blue shirts will be glad to help you find the prefect Apple product. Apple thinks very highly of itself–and thinks you should, too. They desire to be everywhere in your life. With their iPod, they really can be. We move, then, from a company that thinks it should be God, to God–who…well…is. The psalmist is all too familiar with how ultimately unavoidable God is. “If I take the wings of the morning and settle at the farthest limits of the sea, even there your hand shall lead me, and your right hand shall hold me fast.” Apple has “terms and conditions” that you agree to, God has the psalmist tell us just what we can expect from his presence. “Even the darkness is not dark to you; the night is as bright as the day, for darkness is as light to you.” Certainly, this is beautiful language to help describe what is a very real portion of God’s relationship to humanity. Just as that song reminded you of Santa’s prying eye, the psalmist–with equal or greater hopefulness–tells us that there is no place where we can go where God cannot follow. While that can seem so much like an albatross around our proverbial necks, there is an upside. Many, in fact. First, we can seek his direction and protection. This may seem simple enough for us to understand, but it is often the simplest things that can be the easiest to let slide. The all-present nature of God–also referred to as the Holy Spirit–is the continuing presence of God with us. We know that God is with us, but how often do we take advantage of that? I’m talking about taking time to invoke God’s name in a prayer where we thank God for who he is and what he’s done for us, and pray that he might direct us on our way–and protect us that day. How often is that something we do? It is our right as his creation, and our privilege as his children. Second, we can enjoy that presence. Practically speaking, if we go around physically enjoying the presence of God, we might get a few sideways glances–and possibly a new prescription from our doctor. So, what does enjoying God look like? For one, we can balance our worries against the hope God provides. The presence of God everywhere and through all time can be a great reminder to us that no matter–no matter–how massive a weight we have upon our shoulders, there is a way through. The pain that we see right in front of us often prevents us from seeing the peace and love that lies just beyond it. God’s all-present nature can be that reminder to us that life has a sweeter side. Let me not make light of the issue of the pain you are feeling. It’s easy for me to say how easy it is to see past your pain when I don’t know what kind of pain it is you face. No matter what kind of pain you face, it can–and often does–feel impossibly large. It may even feel large enough that we think the only thing that could be responsible for it is God. At the very least, it feels as if God should have done something about it. This leaves you feeling angry and/or bitter at God. There might be a few of you here this morning. That’s why the third benefit to God’s omnipresence is the fact that he seeks you out. The psalmist asks if there is anywhere one can go to escape God, and the answer is no–even if the place that we go is away from him. This isn’t God-as-jilted-lover; this is God as the patient and determined heavenly father. This is God’s Chinese finger-trap. The harder you pull, the more securely you are held. The way I like to look at it is the way Jesus did. There was a shepherd who had one-hundred sheep. One day, a sheep left the flock and fled out toward the hills. Noticing immediately that he lost one sheep, he abandoned the flock to search for the one. He searched and found that sheep, and returned it to the flock–and rejoiced. To all my fellow lost sheep: I would like to–with a wink–leave you with this. Apple may desire to be all-present in your life, but God is all-present in your life. And thanks be to him for that.